(Phaseolus coccineus) 68 days to snap stage, 115 days to dry shell stage. [Pre-1750. Grown by the early colonists who obtained seed from the Native Americans.] Grown mostly in the U.S. for its brilliant scarlet flowers, which are highly attractive to hummingbirds. 8-12 in. pods contain lovely, mottled reddish-purple beans. 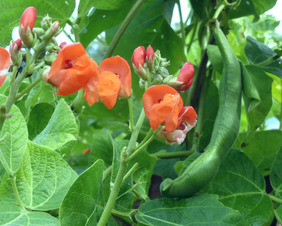 Runner Beans are perennial beans. 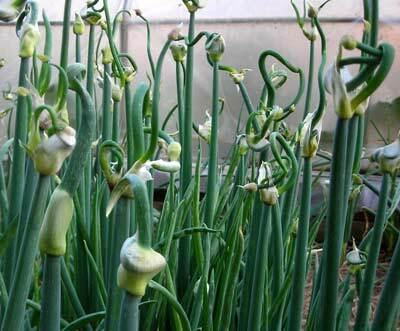 They are tolerant of heat, drought, and cool nights. History: Many runner varieties can be traced back to the Hopi Indians before the arrival of the Spanish, and may have been previously cultivated by the Aztecs. Now widely grown in England. Growing instructions: High temperatures over 90°F may prevent pod set; if grown for food, expect pod production only during late summer or early fall in the Mid-Atlantic and southward. A bulbous root is produced which in mild climates can be dug up in the fall and replanted in the spring. Harvest: Runner beans are eaten as snap beans when pods are small, and can be used as green shelly or dried beans. Dried beans have a nut-like flavor. Seed Savers: Runner beans readily cross-pollinate. For home use isolate from other runner beans by a minimum of 75-150 ft. For pure seed, isolate by 1⁄8 to ¼ mile. Packet: 28 g (1 oz, ~28 seeds) sows approximately 5 poles. Please refer to Pole Snap Bean Cultural Notes for further growing information. Pole Snap Beans, Asparagus Beans, and Lima beans, including Pole Limas, are each listed separately.